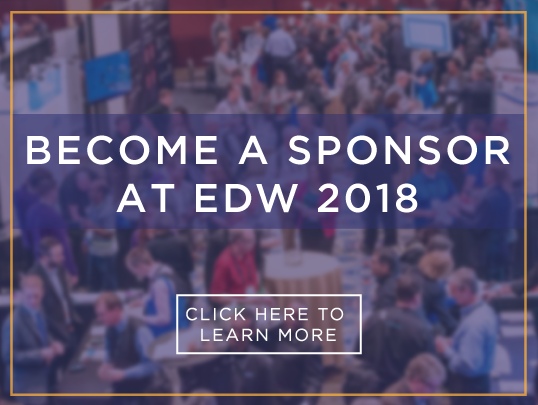 The 22nd Annual Enterprise Data World (EDW) Conference is recognized as the most comprehensive educational conference on data management in the world. 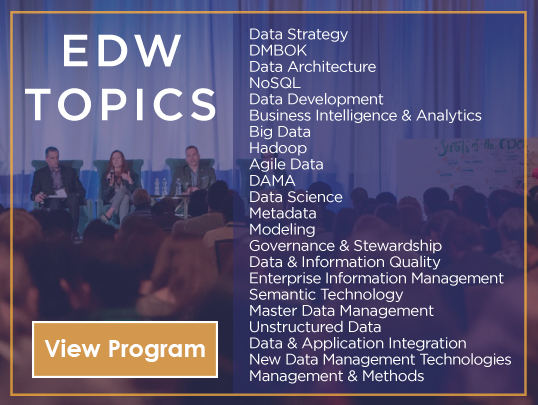 Join hundreds of data professionals from around the globe to attend this unique conference. 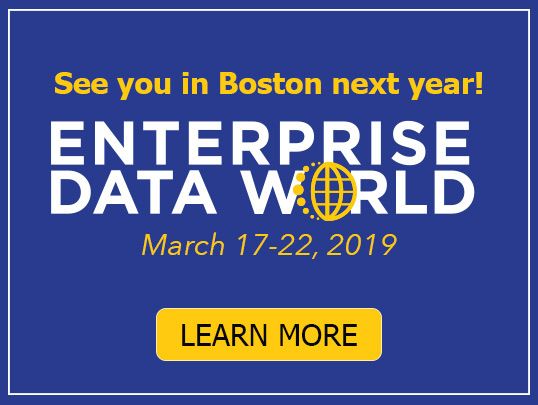 Your transformation to data-driven business starts here! 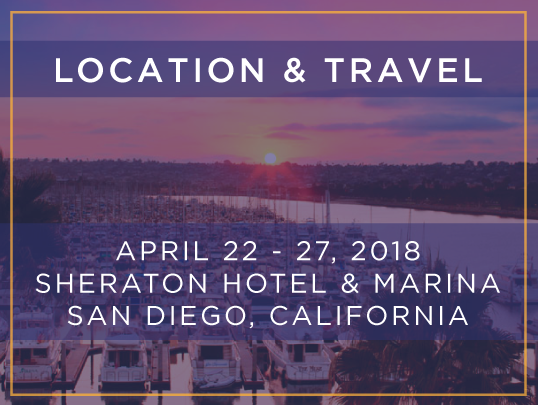 This six-day conference kicks off each year with in-depth tutorials, then continues throughout the week presenting hundreds of hours of educational content driven by leading industry experts, finally closing with our signature two-day workshops. Watson is the AI platform for business, powered by data. Watson can turn unstructured business data into actionable insights that enhance decision making. Watson understands the world in the way that humans do through senses, learning and experience. It learns at scale, reasons with purpose and interacts with humans naturally. Alation is where everyone in your organization can find the data that they need to collaborate. Alation automatically indexes your data by source. It also automatically gathers knowledge about your data. Like Google, Alation uses machine learning to continually improve human understanding. Use Alation to work better together, use data with confidence, improve productivity, and index all your data knowledge. Data Advantage Group, Inc. is a leading provider of enterprise information asset management software. Data Advantage Group's award-winning MetaCenter® Platform is considered the gold standard in meta data management solutions. It enables organizations to easily find, organize, and catalog information assets and to bridge the gap between business and IT communities. The MetaCenter Platform is used by leading companies around the world to deliver easy to use data governance, regulatory compliance, and metadata management solutions. Dataiku develops Dataiku Data Science Studio (DSS), the enterprise data science platform that enables entire data teams to build and deliver their own data products more efficiently. All users, from data scientists and beginner analysts, can easily apply data science and advanced machine learning techniques to all types, sizes, and formats of raw data to build and deploy predictive data flows. Dataiku was founded in 2013 by Florian Douetteau (CEO), Marc Batty (COO), Clément Sténac (CTO), and Thomas Cabrol (CDO). Early on, the company focused on building a best-of-breed data science platform that would enable organisations large and small to streamline the process from raw data to running predictive solutions in production. They sought to bring together data management (transformation, cleaning, preparation), machine learning (modeling and optimization), and production features (REST API, monitoring, etc.) into a single collaborative platform. Datawatch Corporation is the data intelligence solutions provider that will fuel your digital transformation. Only Datawatch can confidently position individuals and organizations to master all data – no matter the origin, format or narrative – resulting in faster time to insight. Datawatch solutions are architected to drive the use of more data, foster more trust and incorporate more minds into analytics and reporting projects. With over 25 years in business, organizations of all sizes in more than 100 countries worldwide use Datawatch products, including 93 of the Fortune 100. Denodo is the leader in data virtualization, providing agile, high-performance data integration and data abstraction across the broadest range of enterprise, cloud, big data and unstructured data sources, and real-time data services at half the cost of traditional approaches. Denodo’s customers across every major industry have achieved significant business agility and ROI. For more information, visit www.denodo.com or call +1 877 556 2531 / +44 (0)20 7869 8053. Experian enables organizations to unlock the power of data. We focus on the quality of our clients’ information so they can explore the meaningful ways they can use it. Whether optimizing data for better customer experiences or preparing data for improved business intelligence, we empower our clients to manage their data with confidence. We have the data, expertise, and proven technology to help our customers quickly turn information ­­­into insight. We’re investing in new, innovative solutions to power opportunities for our people, clients, and communities. To learn more, visit www.edq.com. Innovative Systems has been a premier provider of enterprise data quality, data management, and risk management solutions to Fortune 2000 organizations worldwide for over 50 years. Our powerful, state-of-the-art data quality suite – Enlighten® – includes capabilities such as data profiling, cleansing, matching and deduplicating, address validation, geocoding, and ongoing data quality monitoring. Innovative’s solutions support analytics, customer experience, risk and compliance, and digital transformation initiatives, among others. All solutions are available via cloud, on-premise, or hybrid platforms. ADRM Software is the leading independent provider of large-scale industry-specific data models. ADRM's products are comprehensive information blueprints or roadmaps that enable large companies worldwide to quickly, confidently and effectively apply industry best-practice information architecture to their business problems, while also reducing risk and taking advantage of lessons learned by other similar organizations in their industry, thus accelerating initiatives including digital transformation, data governance, EDW, data lakes, analytics and BI, MDM, ODS and virtualization layers. AnalytiX Data Services is a world leader in Enterprise Data Mapping, Governance and Metadata Driven Automation. More than 1000+ enterprises (numerous Fortune 1000 companies) depend on the AnalytiX DS Unified Software Platform for Data Governance, Centralized Data Mapping, Universal Code Generation, and Automation. Their code automation products are compatible with the leading ETL tools like Informatica, IBM DataStage, Talend, Microsoft SSIS, Oracle Data Integrator, and Hadoop scripts for Big Data. Please visit www.analytixds.com for more details. ASG Technologies brings peace of mind to every enterprise with information access, management and control within legacy and leading-edge environments. ASG provides 70% of Fortune 500 companies with solutions that satisfy their business needs. With our Enterprise Data Intelligence solution, we give companies deep insights into critical business data. Achieve regulatory governance and compliance requirements with zero gap data lineage analysis, which has allowed companies to see more than 200% savings on time and effort. Our solution provides quick, reliable data intelligence to drive your business forward. BackOffice Associates, a worldwide leader in information governance and data migration solutions, focuses on helping customers manage their most critical asset – data. The range of products, built on a revolutionary platform, address the needs of business users seeking to unlock the value of their data assets. BackOffice Associates' products and services enable organizations to accelerate growth, gain actionable visibility and reduce risks. Founded in 1996, BackOffice Associates has an unparalleled track record of success in the most complex data environments across a variety of industries. Bitnine transcends big data problems by creating solutions that are consistently evolving. Bitnine was founded on principles of collaboration, innovation, science and creativity. This is reflected in the company culture where the employees are not only highly skilled, they are highly passionate about what they do. Our primary objective is to achieve business outcomes that position your company for long term success. Bitwise, a Data Management company, uses over 20 years of Enterprise Data Management experience to help bridge gaps between traditional EDW and cutting-edge technologies, including big data and cloud tools. What truly sets Bitwise apart is not just our two decades of experience helping leading companies solve their most pressing data challenges, but our technology leadership in developing unique solutions that automate and accelerate complex processes, including ETL Conversion, ETL Test Automation and ETL on Hadoop and Cloud. FairCom is a pioneer in the software industry, the first company to offer a commercial package using binary tree algorithms on microcomputers in 1979. Today, FairCom maintains its sole technical focus on database technology, continually enhancing its core database technology while keeping up with the latest industry platforms and APIs. FairCom’s c-treeACE engine is the industry's choice solution for enterprise data providing the most powerful simultaneous multimodel access through NoSQL and SQL, giving developers in companies of any size the control to customize their database, and ultimately enhancing performance gains. FairCom technology has been used in solutions serving industries including financial, healthcare, telecommunications, manufacturing automation, accounting, legal, dental, education, construction, aerospace, trucking, gaming, space exploration, oil and gas, energy, major league baseball, fraud detection, public safety and infrastructure management. For more details, please visit: www.FairCom.com. Integrity is fundamental in data, just as in business. Infogix's data integrity and data governance solutions, powered by advanced analytics and big data, ensure that organizations can maximize the value of their data. Data's value is unlocked when users trust that data is accurate, can operationalize insights from raw data, and all stakeholders understand and agree on what data means. For 35 years, our global customers have relied on Infogix data and analytics software solutions to reduce risk, support regulatory compliance, improve profitability and substantially enhance operational efficiencies. To learn more visit www.infogix.com or @Infogix. Since 1985, Melissa has been providing enterprise data quality tools with wide capabilities including data profiling and standardization, cleansing, linking and deduping. Our enterprise-grade products, services and integrations clean global contact data (address, email, phone, and name), verify customer identity for fraud prevention and compliance, and enrich data with demographic, property and location information. Our mission is to provide organizations with best-of-breed solutions that deliver trusted, reliable, accurate information for greater insight. Join the thousands of companies worldwide using Melissa to ensure on-time deliveries, boost communications, amplify business intelligence, and improve the bottom line. For more information or start a free trial, visit www.Melissa.com. Meta Integration is the leading "Metadata Component Provider" partnering (OEM) with most data integration, business intelligence, data modeling, metadata management, data cataloging and data governance vendors. Back in 2002, MITI had already established itself as the "Switzerland of Metadata" as Lou Agosta, then a Giga Information Group analyst expressed in a IdeaByte article. Today, MITI is by far the market leader in metadata harvesting, integration, detailed lineage and impact analysis across multiple vendors, with the largest eco-system of supported tools. The Reports & Requirements Company (R2C) is a wholly owned subsidiary of Buchanan & Edwards, providing data governance, curation, and training support primarily to public sector clients. R2C consultants specialize in the policies and management of large volumes of data and innovative techniques for information collection and dissemination. R2C also develops and delivers enterprise-wide data governance training programs geared toward establishing a consistent understanding of data governance tradecraft and the documentation and curation of data to enable discovery. Our approach to data governance is not IT-focused, but is instead grounded firmly in the mission space, and is platform and technology agnostic. Semarchy s the Intelligent Data Hub™ company. Its xDM platform solves for enterprise Master Data Management (MDM), Application Data Management (ADM), and Collaborative Data Governance challenges for some of the most well-known brands in the US and Europe. This agile platform leverages smart algorithms and material design to simplify data stewardship, quality, enrichment and workflows. xDM platform to address challenges such as The Global Data Protection Regulation (GDPR). 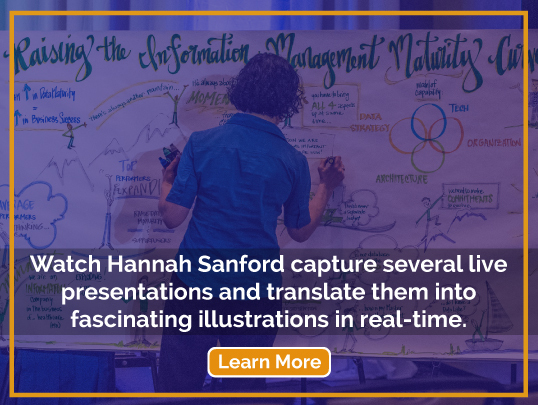 xDM from Semarchy is implemented via an agile and iterative approach that delivers business value almost immediately, and scales to meet enterprise complexity. TopQuadrant helps organizations succeed in data governance with TopBraid Enterprise Data Governance (TopBraid EDG). EDG is the only solution built to support integrated governance across all types of assets and governance needs. It offers a staged approach that can grow organically with your governance program. EDG supports all types of data assets, including business terms, reference data, enterprise metadata, data and application catalogs, data lineage, data exchanges and pipelines, requirements, policies, and processes. These and any other assets can all be connected to bring together enterprise information silos. TopBraid EDG is built on standards-based knowledge graph technology that seamlessly connects enterprise metadata, ensures its quality and delivers easy and meaningful access for all data stakeholders. TopQuadrant’s customer list includes organizations in financial services, pharma, healthcare, digital media, government and other sectors. WhereScape helps IT organizations of all sizes leverage automation to design, develop, deploy, and operate data infrastructure faster. More than 700 customers worldwide rely on WhereScape automation to eliminate hand-coding and other repetitive, time-intensive aspects of data infrastructure projects to deliver data warehouses, vaults, lakes and marts in days or weeks rather than in months or years. WhereScape has offices in Portland, Oregon; Reading, UK; Auckland, New Zealand; and Singapore. For more information, visit www.wherescape.com. CMMI® Institute (CMMIinstitute.com) is the global leader in the advancement of best practices in people, process, and technology. The Institute provides the tools and support for organizations to benchmark their capabilities and build maturity by comparing their operations to best practices and identifying performance gaps. For over 25 years, thousands of high-performing organizations in a variety of industries, including aerospace, finance, healthcare, software, defense, transportation, and telecommunications, have earned a CMMI maturity level rating and proved they are capable business partners and suppliers. To learn more about how CMMI can help your organization elevate performance, visit CMMIinstitute.com. DataKitchen, Inc. enables analytic teams to deliver value quickly, with high quality, using the tools that they love. DataKitchen provides the world’s first DataOps platform for data-driven enterprises, enabling them to support data analytics that can be quickly and robustly adapted to meet evolving requirements. DataKitchen is leading the DataOps movement to incorporate Agile Software Development, DevOps, and manufacturing based statistical process control into analytics and data management. DataKitchen is headquartered in Cambridge, Massachusetts. DQMatters is an eLearning company focused on providing top quality web-based training material and coaching for individuals and organizations that want to increase their productivity, reduce costs, and become more data savvy through advanced data/information management practices. We offer online courses on the fundamentals of data management and Information Quality Certification (IQCPsm) training material, as well as onsite training. DQMatters’ founder and Principal Information Quality Educator, Dan Myers, speaks internationally at conferences and private events on topics of Data Quality, Metadata Management, Master/Reference Data Management, BigData/NoSQL, Blockchain and Architecture. IDMA is a global, non-profit, professional association dedicated to increasing the level of professionalism, knowledge, and visibility of the insurance data management profession through education, research, best practices, forums, and peer to peer networking. For more information, please visit www.IDMA.org. Information Asset specializes in helping organizations build out their data governance programs. The company was founded by Sunil Soares, a thought leader in the industry, who serves as the managing partner. Each data governance process is unique. However; Information Asset often recommends a quick start program called Data Governance in a Box. The results of this method have been consistent -- clean, actionable data which increases operational efficiency and decreases risk. Our most successful engagements go further than day-to-day improvements and data becomes an asset to drive growth. Information Asset’s client list includes businesses from Financial Services, Insurance, Education, Freight, Retail, and Government sectors. Learn more at www. Information-asset.com. intelligentTag inc. has built the world's first graph-based metadata repository and governance framework, called Symmetry3. Symmetry3 integrates easily with today's most popular platforms and infrastructures, providing a 360-degree view of your enterprise. We focus on both new and existing Neo4j data models, and seamlessly integrate key governance tenets, to extend the reach of Neo4j in regulated industries. From business domain definition to role-baed collaboration, our solutions deliver life-cycle data management, with speed and agility. For technology powered visionaries with a passion for challenging the status quo, PSSC Labs is the answer for hand-crafted HPC and Big Data computing solutions that deliver relentless performance with the absolute lowest total cost of ownership. For over 25 years we have dedicated ourselves to delivering the absolute highest quality computing solutions to the world’s most demanding organizations. While other companies talk a good game, we actually deliver. Semantic Arts have specialized in applying semantic technology to enterprise information systems for 18 years. We help enterprises become 100 times more agile at 1/10th the cost simply by leading the data-centric revolution. SmartSoftDQ has been one of the most trusted address validation experts for over 20 years, providing enterprise data solutions to Fortune 500 companies, government agencies, financial institutions, associations, major online retailers and a whole host of other industries. The AccuMail suite of postal and email address validation tools offer integrated solutions for all your systems, on-premise or in the Cloud, for both point-of-entry validation and for managing existing databases. Visit www.smartsoftDQ.com for more information. SplashBI is an on-demand business intelligence and reporting solution that provides users with the ability to run, create, and modify their own dashboards and reports. SplashBI offers cross-application reporting, easy to use user interface, and robust features to improve efficiency. It can be accessed on any platform and device, such as PC browsers, tablets, phones, and Microsoft Excel, providing actionable intelligence to the entire organization. Mays Business School in partnership with the Department of Statistics at Texas A&M University offers a convenient two year, part-time program for working professionals. The Master of Science in Analytics degree prepares working managers and professionals to make quicker informed decisions to optimize business performance and opportunities. Courses will be taught online via live video across North America and face-to-face in Houston, Texas in the evenings. Accepting pre-applications now for our next fall cohort. Uturn Data Solutions is a Chicago-based company at the nexus of data strategy and cloud computing. We provide advisory and technology services to transform data assets into real business value. Uturn’s certified cloud architects, developers and consultants will help you harness the power of Amazon Web Services. To learn more, please visit www.uturndata.com.